It is with great pleasure that I announce a drawing for a quilt. 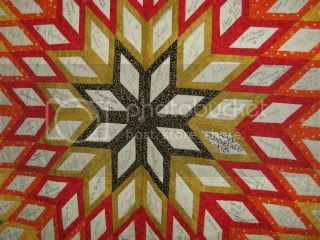 The above pictured star quilt, "All My Relations", was made from 200 diamond shaped patches signed at the 2008 Netroots Nation in Austin, TX. An additional four signatures of prominent Native American bloggers were appliqued in the four corners: Meteor Blades, Speaks Lightning (known as Ojibwa on Daily Kos), Winter Rabbit, and Dengre. A full list of signatories may be found here. My own design, I machined pieced and hand quilted this piece. 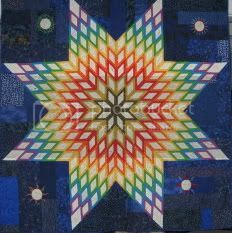 The quilt measures 65" x 67", is made of cotton fabrics, cotton batting, and is decorated with Austrian crystals, Czech beads, and a piece of rutilated quartz at the center. The quilt is sleeved for hanging. 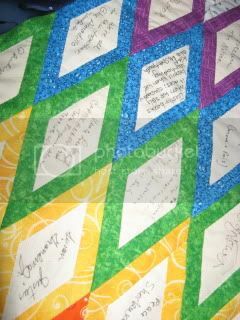 I made the quilt in a promise to navajo to make something to support Native American people. She chose the beneficiary – INDN’s List, an organization supporting the election of Native Americans to public office. Please visit the INDN’s List website and learn more about them! The quilt could be yours. 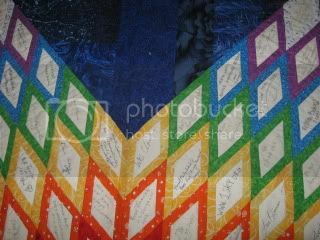 Every contribution of $10 or more per day on this Act Blue page between now and August 15, 2010 will represent one chance in a drawing for the quilt on the last day of August. If you cannot donate, you may also enter by writing an essay of 50 words or less on this subject: "INDN's List's Mission -- Why it Benefits Everybody". Put the title in the subject line and email your essay on or before August 15, 2010 to communityquilts (at) yahoo (dot) com. If we find your essay to be topical, we will enter you for one chance in the drawing – one essay per person. 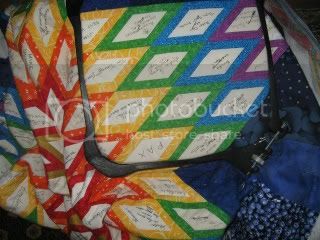 The quilt will be on display at the Community Quilt table in the Exhibit Hall at Netroots Nation – please come by for a closer look! Thank you in advance for your support of INDN’s List. Originally posted to Sara R on Wed Jul 14, 2010 at 06:05 PM PDT.